Swarovski crystals, LED lights, and gravity. 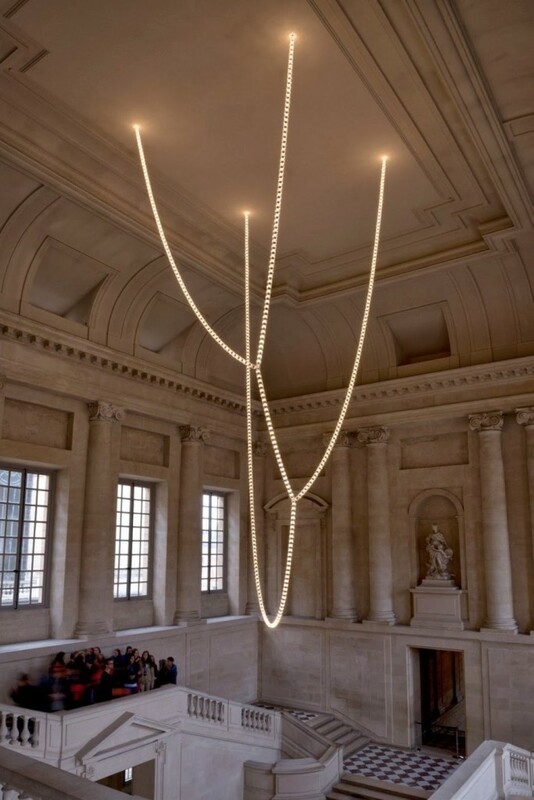 These three components come together in Ronan and Erwan Bouroullec’s new chandelier in the Gabriel Staircase at Château de Versailles. The 800 Swarovski crystals reference history, alluding to the crystal chandeliers which would have been installed in this staircase (designed by French architect Ange-Jacques Gabriel in 1772) had revolution not gotten in the way. Both the shape of each crystal, and the LED technology used to illuminate them, use the best in technology available today. Gravity pulls at each strand of crystal, causing it to curve and loop with its own weight. The chandelier is not trying to blend in (we know it is a modern edition), but is also not out-of-place in this amazing building.